Neighborhood weekend warriors are very resourceful, and they can accomplish some amazing home improvement projects over the weekend. However, most of them know just enough about insulation, panels, shingles and gutters to know they shouldn't even consider doing their own roofing. You might be handy with tools and already have a ladder, but there is a good chance that you know very little about spotting water leaks, structural damage or proper installation. Before you consider a costly repair job or building a new roof on your house or garage, consider these thoughts. Do You Have the Experience and Qualifications? • Installing new roofs or troubleshooting repair issues requires design knowledge and experience that average homeowners don't have. Most roofers receive training in apprenticeship programs or as journeymen to learn the craft. For the most part, homeowners wouldn't know where to begin to figure out insulation requirements or where gutters should be placed for adequate drainage. • In addition to having professional training, roofers must be physically fit to be able to balance, climb, bend and kneel for hours at a time. Do you think you're physically capable of doing this work? • Besides being physically demanding, putting on a new rooftop can be extremely dangerous, especially to those that are not trained or qualified for the job. Safety should be an important consideration. • You should also consider expenses such as ladder purchases, scaffolding and tools or miscellaneous equipment needed for the job. Then, there is also a matter of your time. Homeowners with little or no experience take even longer to plan and complete this type of project. • Unfortunately, there is also the possibility that you might make serious mistakes. If that is the case, it will undoubtedly cost you even more money to hire a professional to repair the damages. 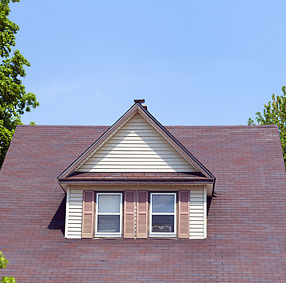 Does the House Need New Roofing? Determining the age of your roof can help you to decide whether it needs replacing or if you can add a second layer of shingles without replacing the entire roof. 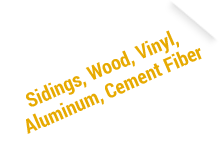 Typically, asphalt shingles last about 25 years with proper insulation and venting. 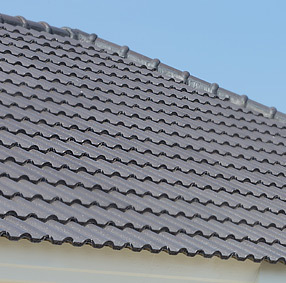 • Inspect the roofline for irregularities and look to see that that tiles are not sagging or no longer in a straight line. Crooked or sagging tiles may indicate structure problems. • Check the tiles to see if they are misshaped, curled or cracking. Are there missing tiles that could be causing a leak? • Go into your attic after a rainstorm, to inspect for water leaks or signs of moisture. You should also look for sunlight coming through the roof panels, which may mean there is damage to the rooftop. • Finding asphalt granules in gutters can also be an indication of wear and old age, which may mean the roofing is past its prime. If you see one or more of these signs, then you should consider getting a professional evaluation. How Do I Hire a Professional Contracting Company? Look for contractors and companies that have been in business for at least a couple of years and do not have a poor record with the Better Business Bureau. Ask friends, neighbors and co-workers for recommendations. Seek out roofers that carry liability and workers' compensation insurance. Make sure they offer a warranty of at least five to 10 years. Ask potential candidates for customer referrals to verify their quality and workmanship. Age, weather and storm damage can eventually cause damage to rooftops. 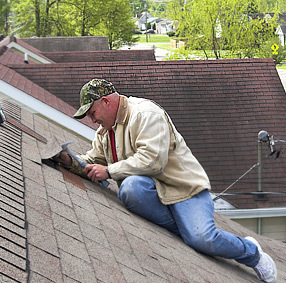 So, you just might find yourself in the position of needing a repair or a new roof. If you don't have the qualifications and experience to tackle the work, you should consider calling professionals to save time and money.